Holmes. I am not Dr. Watson and he is not presently here. Beulah. Watson. Holmes! What difference does it make? Holmes. Watson doesn’t play the violin, Madam! Beulah. What difference does that make? I’m here because my son has vanished. Holmes. Yes, I believe that is precisely what you have previously stated. Are you certain that he just hasn’t taken a long weekend out of town? Beulah. Chester would never leave town without telling me. Beulah. You’re not listening to me, Dr. Watson. I’m his mother. Holmes. Then he should have let you know where he was going. And my name is Holmes. Beulah. I am trying to tell you that Chester would never leave town without telling me. Holmes. How can you be so certain? Beulah. (Warmly) Because he loves me. (Complete change of tone) Because he knows that when he gets back, I’d kill him. Holmes. Ah! That makes perfect sense. All right, let me get further information. (Holmes gets out a pen and paper, or perhaps begins using his computer) What’s his full name? Beulah. When I was young, I was in show business. County Fair Circuit. Holmes. So, then, you kept your maiden name? Beulah. Correct. Chester’s father was my third husband. He was a White. Holmes. Now I see. His age? Holmes. When was the last time you saw him, Mrs. Berkshire? Beulah. When he divorced me -- three years ago. Beulah. Friday about 5:30. I was just putting pop corn in the microwave. Holmes. How long did he stay? Beulah. Just long enough to pick up his high school year book. He was in a hurry. He said he had to pick up his date. Holmes. Did he mention the name of his date? Holmes. Has he been dating anyone in particular? Beulah. Not that I know of. Holmes. Are you saying, you have no idea at all? Beulah. All I can tell you, is that before he got his own place, the girls were calling him all the time. Lots of them. Holmes. Would you be so kind as to give me his physical description? Beulah. I’d have to say he’s uncommonly handsome. 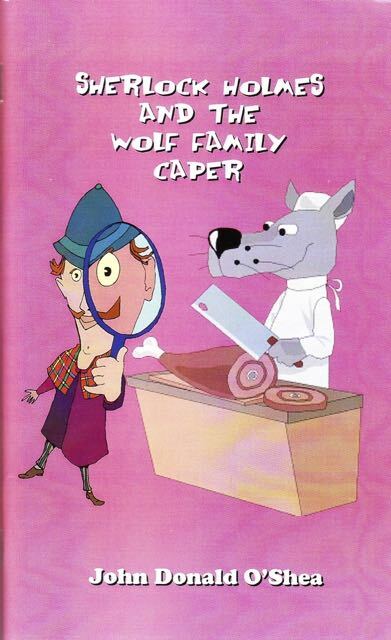 In this adorable “Law and Order” type mystery, the audience is called upon to help out Sherlock Holmes and his sidekick, Dr. Joan Watson, solve the mystery of “The Wolf Family Caper.” Holmes and Watson are investigating the mysterious case of two missing pigs. Not only have the pigs disappeared, but a straw house and a stick house have vanished as well. Just when Holmes and Watson begin to think they have a serial house-napper on the loose, they discover a single paw print at the scene, which gives rise to the "Huff-and-Puff Theory." Suspecting a wolf may be the culprit, Holmes and Watson pay a visit to Ezekiel Wolf, the owner of a local pork processing plant. When the duo suggests that a wolf may have huffed and puffed and blew the houses down, Mr. Wolf’s hair bristles at the insinuation, and he insists that such stories are just old wives’ tales. And, besides, he suffers from emphysema. As Holmes and Watson continue their investigation, they discover that all clues lead back in some way to the annual Wolf Family Picnic Extravaganza…. In a word, this play is "fun." The characters are painted broadly. And each character gives the young actor a chance to go beyond himself or herself and become an actor. The play is based very “loosely" on the traditional story of the “big bad wolf” - very loosely indeed! That “imprecision” has allowed me to surround my “wolf" with a bevy of memorable and colorful characters. Performance Time: Approximately 90-120 minutes, 84 pgs.